During the 1950s mass production and new technologies were celebrated by the Media. Novel materials were to influence all areas of life, from the daily maintenance of the living space to the built environment as well as the production of art. Architect and writer Theo Crosby’s initial idea for an exhibition involving architects, artists, designers and theorists resulted in This is Tomorrow which took place at the Whitechapel in 1956 in collaboration with members of the Independent Group. The theme was the ‘modern’ way of living and the exhibition was based on a model of collaborative art practice. The 38 participants formed 12 groups, which worked towards producing one artwork. The outcome transformed the Whitechapel Gallery into a vibrant interactive space of installations. ‘A lesson in spectatorship which cuts across the learned responses of conventional perception’ wrote Laurence Alloway in the introduction of the original catalogue. An iconic show in its conception and realisation it has continuously interested artists, theorists and curators ever since due to the challenge it posed for the creative practitioners and visitors alike. The former, as each group was polymorphic formed by an architect, a designer, an artist and a theorist, were requested to amalgamate their individual approaches and produce a work by deploying a new methodology. The latter, with no interpretation panels and other information available, had to make their own judgements as to how to navigate inside the gallery and interpret the works they viewed. The material presented gives an account of the production process as well as the final result of this collective curatorial enterprise: documents from the Gallery’s Archive, the original promotional posters designed by each group, artists’ personal correspondence and rare photographs. A layout of the original 1956 catalogue is reproduced in the Foyle Reading Room. On the occasion the Whitechapel Gallery has issued a limited edition of the original This is Tomorrow catalogue. Group 1: Theo Crosby, William Turnbull, Germano Facetti, Edward Wright. Group 2: Richard Hamilton, John McHale, John Voelcker. Group 3: J.D.H. Catleugh, James Hull, Leslie Thornton. Group 4: Anthony Jackson, Sarah Jackson, Emilio Scanavino. Group 5: John Ernest, Anthony Hill, Denis Williams. 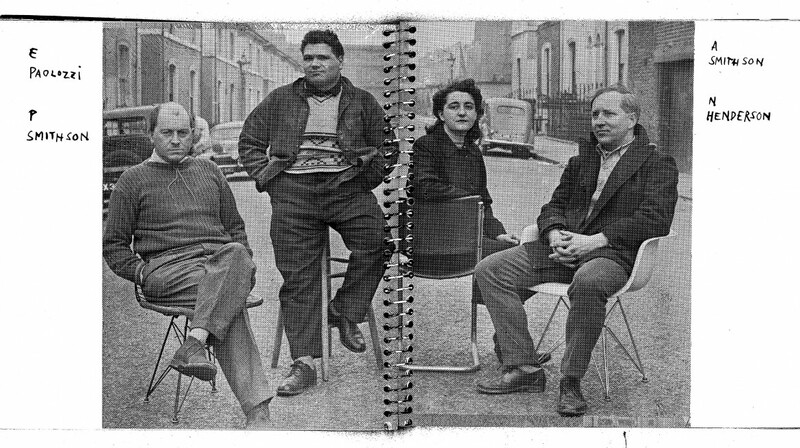 Group 6: Eduardo Paolozzi, Alison and Peter Smithson, Nigel Henderson. Group 7: Victor Pasmore, Erno Goldfinger, Helen Phillips. Group 8 : James Stirling, Michael Pine, Richard Matthews. Group 9: Mary Martin, John Weeks, Kenneth Martin. Group 10: Robert Adams, Frank Newby, Peter Carter, Colin St.John Wilson. Group 11: Adrian Heath, John Weeks. Group 12: Lawrence Alloway, Geoffery Holroyd, Tony del Renzio. Thanks to: RIBA Library Photographs Collection, The Victoria and Albert Museum, Juan Cabello Arribas, Richard Hamilton, John-Paul Stonard, Anna Yandell.